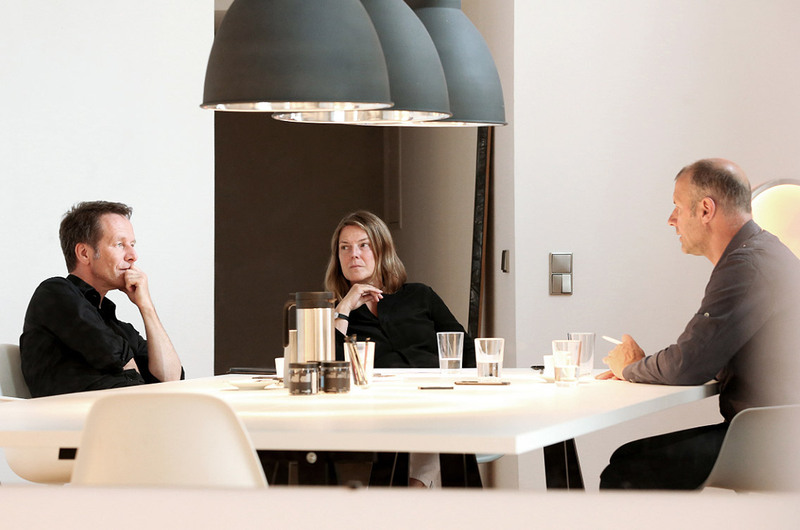 An interview with Joerg Dietz and Christina Balcke-Herlyn, a designer couple from Bielefeld. Thomas Ritt, freelance designer and product manager for GERA Leuchten conducted the interview. GERA: Hello Joerg, hello Christina. We have known each other since school and university, as friends and colleagues. You are both passionate about design and worked for Rolf Heide and together for Jan Wichers in the early 90s in Hamburg. You were then responsible for design for Bosch Küchen and SieMatic for a number of years. You have had your own design office in Bielefeld for over ten years and design for the furniture industry. What in your opinion has changed in the past 25 years in "furniture design" as a profession? Joerg Dietz: The furniture industry has become more concentrated. Manu­facturer and suppliers are becoming larger, the smaller ones are disappearing. The "time to global market" dictates tempo and form. The price decides. The result is that product managers and buyers often replace designers with the result that the manu­facturers’ product range is becoming increasingly similar. But without distinguishing features the manu­facturers can no longer keep in touch with their customers. This is where it comes down to the design, to make differen­tiation possible and to establish clear brand images. Christina Balcke-Herlyn: Exactly. Particularly as the trend is reverting to inexpensive but inter­changeable mass produced products: If you value indivi­duality and quality, you buy handmade furniture. GERA: Christina, as well as your work as a designer, you discovered your passion for painting at an early age. What do you consider to be the connecting element in art, and what in design? Christina Balcke-Herlyn: When I paint I express what I see. Completely subjectively. However, zeitgeist influ­ences flow sub­consciously into the piece. It’s different in design: From the outset it involves developing a joint vision together with the customer. A common style, an under­standing of innovation. Good furniture products create a sense of identity. This is apparent in GERA’s presentation, which has been continuously evolving for years. The brand’s consistent aesthetics are contagious. GERA: In your collaboration with arsnova you focused on the concept "the customer is female". Does this type of formula have any impact on today’s furniture design? Joerg Dietz: Women look for a different design, they have a different approach to buying. But design according to the "Shrink it and pink it!" formula, would be over­simpli­fying the challenge. Christina Balcke-Herlyn: Women decide to buy primarily with a focus on accessories. A fact on which e.g. IKEA builds their concepts. They focus on connected home environments, not on innova­tive technical details. GERA: Is GERA’s design in your opinion shaped by gender-specific ideas? Christina Balcke-Herlyn: No, I don’t believe so. GERA designs primarily with light. That is a basic human need and wins over women and men alike. GERA: You use the GERA pendant light 40 x 10 as a work light in your office. What feature made you choose this model? Christina Balcke-Herlyn: We follow the concept of a "work panel". We were able to order the lights to individual measure­ments up to almost 4m in length. The light seems to appear from nowhere. This fine, elegant light can be integrated discreetly into the room and "works" even when it is not switched on. GERA: Joerg, you have been working for some time as a developer of furniture decors and furniture sur­faces. Your latest furniture develop­ments include artificial light as an additional ingre­dient. To what extent are these components compatible with each other? Joerg Dietz: Furniture design remains a non-altering statement with the effects of colour, decor, structure and surface. Light brings an additional highly emotional factor into play. The use of light colour effects on furniture and the living atmos­phere is parti­cularly fascinating. Light has a high level of potential as an interior design element. GERA: Sustainability as a social principle is already estab­lished at least as a marketing term. To what extent can furniture designers contribute to achieving this principle and what is your greatest wish in this direction? Joerg Dietz: Furniture has to become more endearing. It has to offer more than the latest trend and low prices. The quality of system furniture from the 80s and 90s is exemplary in this respect. The designers from Flötotto, interlübke or USM made their furniture with the potential to offer continuous use, be converted and to survive. Furniture with a history. Designers have to revive this type of inspiration. Christina Balcke-Herlyn: A number of upcycling approaches from young designers are taking a step in this direction. New furniture as a collage of the old. GERA: Dear Christina, dear Joerg, thank you so much for your time.